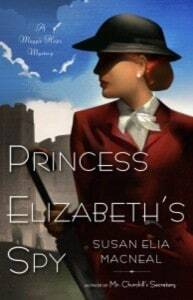 Princess Elizabeth’s Spy by Susan Elia MacNeal is the second book in the Maggie Hope Mystery Series of books. In the follow up to Mr. Churchill’s Secretary, protagonist, Maggie, when the world is at a standstill due to World War II, is now training to become an MI-5 agent. Unfortunately for Maggie, she was not gifted with the physical talents necessary to become a full-fledged agent in the midst of the war. Therefore, she is soon sent back to London for a new assignment. She must work as Princess Elizabeth’s governess, while doing a bit of spying. Maggie is quite modern for a woman of her era, therefore, she is more than a little offended by her new assignment. She is a woman of high intellect and fully trusts her abilities; therefore, such an assignment appears demeaning. However, Maggie’s opinion of her new assignment soon changes after her arrival at Windsor Castle. A murder has happened on the grounds and she realizes that this may be her most challenging job yet. Some old faces from Mr. Churchill’s Secretary, return in Princess Elizabeth’s Spy. From the loveable David to her enigmatic father, they are all relevant to the story, as well as Maggie’s progress as a character. We are also introduced to new characters, such as Hugh and Gregory, which are critical to the plotline. Also, Maggie’s character is a delight. She is a strong and modern, yet caring woman in intense times. Her character’s attributes are much needed and hard to come by in most novels, which is why MacNeal must be applauded for creating such a complete protagonist. The surrounding cast also adds needed depth, it was easy to find myself questioning the motives of certain characters and wondering if he/she could be trusted. Also, of note, the character of Princess Elizabeth is beautifully crafted. She is portrayed as an empathetic and wise 14 year old who realizes the importance of her position in life. The novel’s pace moves well and is easy to follow, which is important when delving into a suspenseful read. Maggie also finds a potential new love in Hugh, which is a positive for her, after recently losing her first love, John. New twists and turns are also unveiled in this mystery, the most major one pertaining to her mother and father. I look forward to reading the follow up to Princess Elizabeth’s Spy, His Majesty’s Hope and gladly recommend that all lovers of mysteries read the Maggie Hope series of books. I am always looking for a good new book to read and one with a love interest sounds fun. Thanks for the review! Just finished watching the program Sunday Morning and they had an entire segment on how self publishers have come dominant book sales on amazon. I will definitely keep my eyes open for this book in future. Thanks for the great review! I didn’t know there was a sequel to Churchill’s Secretary! Great review. 🙂 Thanks. Ooooh, this sounds great! Thanks for the wonderful review! I haven’t heard of this series before but it sounds interesting. I like books about spy’s and a good mystery so I’ll be checking out the first one see if it’ll be something I’ll like. Thanks for the review! I love novels set during WWI and WW2 this sounds like an great addition to my list in Good Reads. This might be a good read for me. Always looking for new and interesting reads, thanks for the review! This would be a book I would enjoy. I love reading about the Royal family. I think this one would be good. I think I’ll put this on my Goodreads bookshelf as a one to read and see if it is available from the library for Kindle. Nice review! I just got this book and I’m really looking forward to reading it. I always love interesting novels. The cover is beautiful. This sounds like an interesting series! I love a good mystery.